Ahhh, the silly season is very silly indeed. December has been my busiest month of the year for such a long time, that you'd think I would be used to it by now. But every year I'm surprised and caught out by how crazy December is. I love seeing people's Christmas reading lists, #SummerReadingStacks and #20booksofwinter - such ambition - such hope! Every year I join in... and fail miserably. The December part anyway (I get back on track in the New Year). I forget how hard it is for me to read anything during December. For the past week, I've been trying to finish all those big books I started during #AusReadingMonth but can barely manage a page or two at a time. My brain wanders off to make lists of things to do instead. I was getting frustrated and annoyed. Until I remembered that December reading has to be light, easy and instantly engaging. This weekend I revisited my childhood. 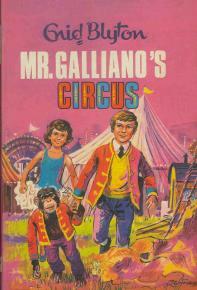 Mr Galliano's Circus was one of my favourite Enid Blyton books (the other being The Secret Island). I have no idea how many times I reread them. A conservative estimate would be three or four times each for about five or six years. Blyton's ability to tap into the secret world of childhood dreams and wish fulfilment was extraordinary. I'm sure there would be/could be/should be a psychological study into the Blyton we love and what it says about us. My two favourites involved running away to make a new life for yourself free of the restraints of parental figures or everyday routines. New places where you could shine and excel and be rewarded/recognised for your talents and hard work. Mr Books' favourite Blyton as a young boy was The Adventures of Pink-Whistle. A half human, half brownie character who could make himself invisible. He spent his time doing good deeds to help others. 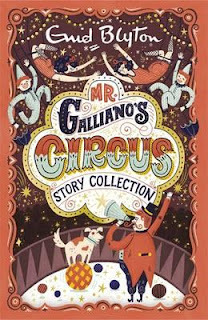 Rereading Mr Galliano's Circus at 48 was almost just as much of a treat for me as it was when I was eight. Even as a child, I knew Blyton was writing fantasy. Even when, or especially when, the story seemed rooted in everyday life. Why, we all know that no animals will play or work properly for us unless we love them and are kind to them. If Mr Galliano saw anyone hitting a dog or a monkey he would send him off at once. We love our animals and feed them well, and look after them. Then they are so full of love and good spirits that they think it is fun to play and work with us. There is a brief mention of the untidiness of circus folk and their lack of education, but mostly this book is about goodness and kindness. The folk who do bad things like mistreat animals or steal, get their comeuppance. Those who act poorly at some point are shown a better, kinder way. They eventually see the error of their ways or apologise or make amends. Now that an obstacle has come and you can't get what you want, don't worry about it. The best way to treat obstacles is to use them as stepping-stones. Laugh at them, tread on them, and let them lead you to something better. I recently discovered that there is a new updated story collection of Mr Galliano to introduce new generations to the charms of circus life. I was delighted and horrified to discover this was actually a trilogy. I wish I'd known as a child - but I wonder if Hurray For the Circus and Circus Days Again could have lived up to my very high expectations? The running away part that appealed to me so much back then was satisfied by the first story...could the other two possibly resonate in the same way? Perhaps between now and Christmas we will find out? What was your favourite Blyton? What do you think it said about you? What deeply personal desire did her books satisfy in you? I loved these circus stories myself when I was a child - and was very shocked later on in life to find out that there were animal rights activists militating against the use of animals in circuses, as I was firmly convinced they were treated with great love and respect. I was so disappointed the first (& only time) I went to a circus. The animals did not look happy at all. We're the other 2 circus books entertaining reads too? As I told Marina today..."The greyness of the day has me in its grip. I want to write a post ‘best of 2016’ but cannot find the inspiration. I’ve put out all these goodies for the birds to eat….even they ignore me. Gems of books…time to reach for one and travel to lost time: a ‘Village Christmas’ (..in the Cotswalds) by Laurie Lee…. brings back memories of festive days seen through the eyes of a child." When I find I need a 'good laugh' to shake off the dust of a gloomy day...I turn to children's books. As you said... I try to find the silly in a silly season. Books by A. Blabey (you've reviewed several, Pig the Pug or The Bad Guys) ) and the adventures of Bunnicula (J. Howe) the Rabbit-Tale Mysteries.... these animals leave me LOL! Stay calm during the 'last shopping days before Christmas'...the crescendo of the season! I actually love the busyness at work these last few weeks. Nearly everyone is buzzing with festive good cheer and happy to be talking books.